Established in 1983 as part of the Byblos Bank Group, ADIR Insurance has since garnered over three decades of experience in delivering top-of-the-line covers with exceptional quality of service to the widest range of clients. As a forward-thinking company, ADIR leads through innovation and excellent customer service. Additionally, it maintains its financial stability through constant growth, which has placed it among the top ranks in the Lebanese insurance market. 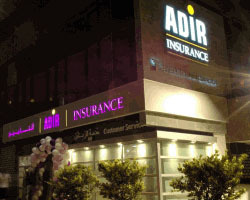 ADIR should be recognized as one of the most reliable and trustworthy insurance companies in the region for providing quality service and ensuring customer satisfaction. ADIR is an institution that provides a diversified, innovative range of insurance plans with quality services to its customers, top performance and profitability for its shareholders, and professionalism and career development opportunities to its employees. ADIR is constantly seeking its community’s welfare and environment.